The Happy Amateur: Weekly Wikems. June. It's Thursday, feel like writing a wikem? Frederic Leighton's "Flaming June" is in New York through Sept. 6 at the Frick Collection. Visit her if you get a chance. 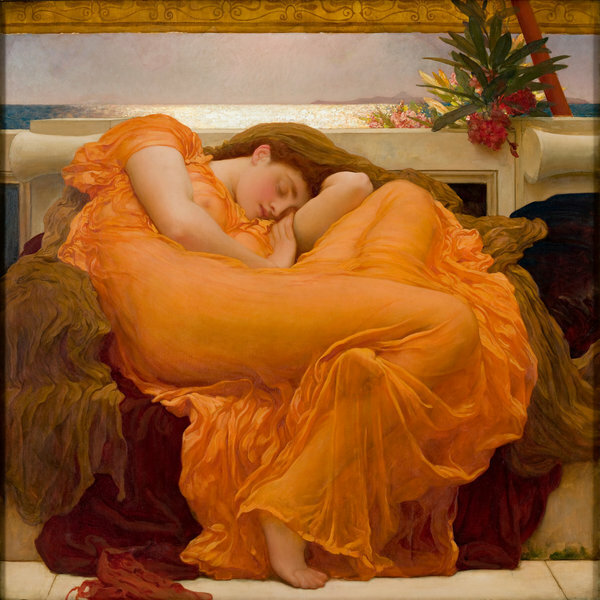 "Why it's called 'Flaming June,' no one knows." For the review that with authority "dismembers" the painting, this line is an acknowledgement of defeat. I say, thank goodness we don't know everything. Let's enjoy the painting. And let's talk about June today. forever young, she's you, she's flaming June. Look forward to your poems. o-o-o-o! so many great bits in this gem; gauze of time, reposing truth, ancient tune forever young...thank-you. Mine will be late. We're in the end-of-school-year rush as well as trying to ship-shape the house and yard for a few events we're hosting in the next week, but June, (one of my favorite words in the world and slipping away before my very eyes) will be immortalized in ink if I get the chance:) see you soon!